26/04/2017 Family: William Wigton, Margaret ‘Harriet’ Wigton, Frederick Wigton (born 18th May 1885), Sarah Wigton (born 3rd June 1887), Ellen Wigton (born 14th October 1889), William Wigton (born 18th January 1893), Robert Wigton (born 8th August 1895), Andrew Wigton (born 16th April 1900). 26/04/2017 The 1901 census records Frederick as 16 years old. He was working as an agricultural labourer, like his father. The family were living in Cavan, Bernagh, Killyman, County Tyrone. 26/04/2017 Frederick was born on 18th May 1885 at Cavan Hill, Killyman, Moy, County Tyrone. He was one of six children. 26/04/2017 Frederick Wigton was the eldest son of William and Margaret Wigton. William Wigton married ‘Harriet’ Powell on 25th January 1884 in the district of Dungannon. 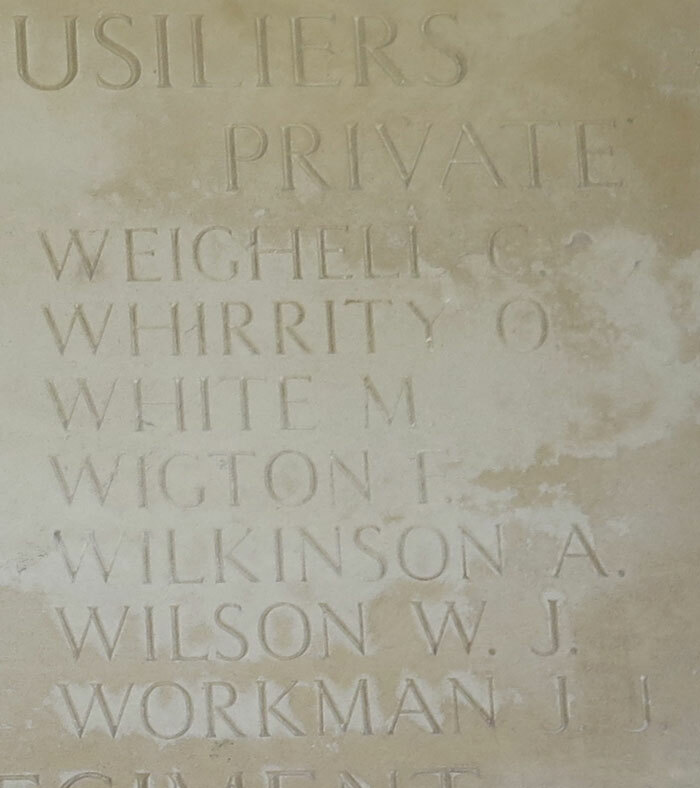 30/12/2015 Private Fred Wigton has no known grave and is commemorated on Pozieres Memorial. 30/12/2015 Private Fred Wigton, Royal Inniskilling Fusiliers, who is reported wounded is a son of the late Mr William Wigton, Cavan, Killyman, Dungannon. 30/12/2015 The CWGC also records Frederick Wigton as the husband of Mary Ann McMinn Wigton, of Culnagrew, Dungannon, Co. Tyrone. 30/12/2015 The CWGC records Frederick Wigton as the son of William and Margaret Wigton, of Cavan Hill, Killyman, Moy, Co. Tyrone. 30/12/2015 Private Frederick Wigton (27312) was serving with C Company in the 9th Battalion of the Royal Inniskilling Fusiliers when he was killed in action in France & Flanders on 29th March 1918, age 33. 30/12/2015 Frederick Wigton enlisted in Dungannon.